There’s not much to report since my last post. 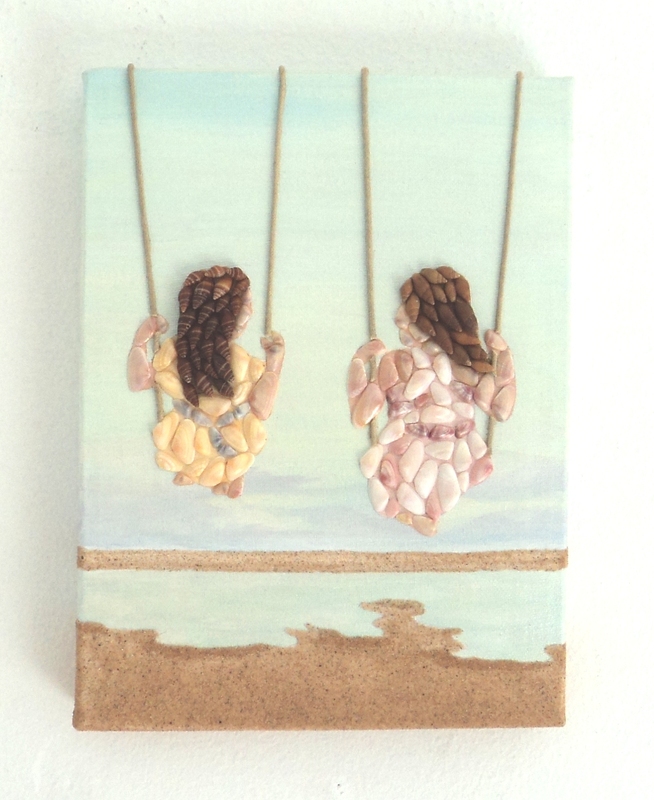 Working on my Seashell Mosaic Collages is always a given, because whenever there isn’t anything else that takes priority – I am busy creating! This is also the time of year that I do my seashell sourcing and place orders with my regular suppliers. But I wanted to write this final post of 2018 before I return to the UK on Saturday morning. In the last few weeks I have been out and about socially and had some fun nights at local gigs in Almyrida and Vangeli’s in Plaka. I have also enjoyed my Spa treatments – courtesy of my good friends here on Crete, who gifted me these wonderful treats at my Birthday party! I’ve been shopping in Chania and made the odd brief scan of Kalyves beach after storm Penelope! Easy to do at the drop of a hat as it’s only a ten minute drive from home. But the best day out – by far – was a couple of days ago, when Debbie, Kim and I went to Bali for the day. I had been wanting to arrange another day of beachcombing for many weeks. It’s been at least a month since Debbie and I went to Falasarna. But the weather has been miserable, with lots of rain almost every day. In fact it was really difficult to find a day that wasn’t forecast to rain. However, I struck lucky when I chose Tuesday because it was sunny, warm and calm – just perfect beachcombing weather! I was driving – another chance to enjoy my new car – and after picking Debbie up from Vamos and Kim from Kalyves, we headed off to Bali. When we got to the first main Beach, I was surprised to find that the taverna opposite, which is usually always open – was shut! The whole area was utterly deserted! The drive had taken about an hour and a half and so we all fancied coffee and juice, especially after a quick inspection of the beach proved disappointing because of the lack of Seashells. This was because the sea was rougher than I had ever seen it there, the waves taking up nearly the whole depth of the beach. The seashells were all in the waves! Kim and I wander along the second beach in Beautiful Bali. However my usual optimism kicked in and I told Debbie and Kim that there were still 3 other beaches to explore! Neither has been to Bali because Debbie doesn’t have a car and Kim only recently arrived on Crete in August. So off to the next beach we went and this was also completely deserted, with no open taverna or cafe in sight! Thankfully, there were more shells, stones and general beach debris along the shoreline of this beach. After about an hour here we really were looking forward to refreshments and so I took Debbie and Kim to the beach at the port, where I had often had coffee during winter beachcombing. But when we got down there, everywhere was shut up and apart from the odd schoolboy or fisherman, there wasn’t anybody around! I suddenly realized that I had not been to Bali for a few years and how much it seemed changed and so quiet. I can only assume that over the last few years, the strict austerity measures and lack of tourist spending power may have contributed to this. Or is it just that this pretty little resort of Bali has become only a summer place now? The tiny Port in Bali, where we all sat and enjoyed our picnic! Where we all live – in the Apokoronou area of Crete, there is quite a large spread-out expat community and this keeps all the shops and tavernas open all year instead of just for the summer. We came to Bali to beachcomb and so this didn’t bother us and in fact, was a bonus! The sun was shining, it was pleasantly warm and we found a great spot at the edge of this beach by the port, to enjoy our picnic. We ended up having such a laugh! It was delightful to have, what seemed to us all – the whole of beautiful Bali to ourselves! When I pointed out the final beach to Debbie, she was raring to go even though we had many steep steps to climb up and down, in order to reach it. But this was also no problem for us as we all enjoy the exercise. It’s exhilarating! When we stepped off the last one onto the sand, we all agreed that it was the best beach out of all four! We also found some really good stuff there, including some rocks I had never seen before – unusual very flat rocks with what looked like gold and silver streaks in them – absolutely gorgeous! When covered in varnish, they will reveal all their magnificent colours.. as they do when they are in the water. Kim collected bagfuls of these and other interesting rocks and stones too. 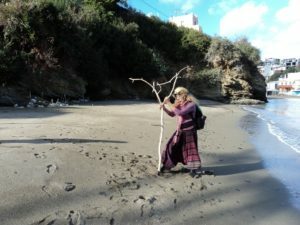 It was a wonderful beach and we stayed there for quite a while before heading back – arms full of beach treasures – for Kalyves and a long-awaited coffee at Apicorno! It was a wonderful adventurous day out with stunning scenery wherever we went! Add this to amazing company.. and we all have so much in common! Debbie, Kim and I all share a passion for this wonderful life we have access to here on Crete! The best beach by far! Leaving our mark in the sand, Debbie looks the part in our Bali adventure! Now that Christmas is not too far away, I am so looking forward to going back to the UK and being with all my family again. Christmas this year is at Emma and Ash’s home on the RAF base down south. Rich is driving Zoe and me down there on the Friday and we will all stay until Boxing Day. I can’t wait to see Ralph and Neve! I’m also looking forward to seeing Mum and staying with Karen and Mike, where I will be sure to see everyone else and also catch up with all my friends in the UK. 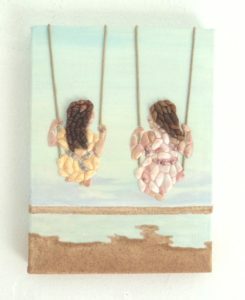 This entry was posted in Blog Posts and tagged Almyrida, Bali Crete, Chania, Seashell Mosaic Collage by micmaryjo. Bookmark the permalink.